Anderson is back in New York tonight. We're going to launch a new way to take part in the 360° live blog. Tonight we'll debut a live web camera from the 360° studio. The shot features Anderson and Erica behind the scenes on the set. We'll turn the camera on at 945p ET and turn it off at 11p ET. As for the live blog, we'll start posting comments at 10p ET and stop at 11p ET. As the Democrats continue their primary battle, John McCain has launched his biography tour as a way to re-introduce himself to voters. It will emphasize his half-century of public service highlighted by his military record and tremendous sacrifice. But in an op-ed today, conservative commentator Bill Kristol argues biography alone won’t be enough for McCain to win in November. In fact, if you look back at the last four elections the candidates with stronger resumes all lost. And those four candidates, George H.W. Bush, Bob Dole, Al Gore and John Kerry, were all war veterans. But for some Democratic voters biography has played a role in their decision. Many of Obama’s supporters specifically point to his diverse background as a factor for choosing him over Clinton. So how much does a candidate’s biography matter to you? Does McCain’s provide an edge over either Obama or Clinton in a general election match-up? Will the historic biographies of becoming the first women or African-American give Clinton or Obama an advantage? I know, I know. I haven’t blogged in a while, and yes, my new year’s resolution was to blog everyday. Or was it just to blog more frequently? I forget. Criticize all you want, but how many of you have kept your new year’s resolutions? I got back from Los Angeles yesterday, and it was great to get home. A lot of people have been sending me notes, wishing me well after my little surgery. As I said, it really was not a big deal, but I appreciate all the kind notes and cards you’ve been sending. Thank you. My stitches are out and I rarely think about it anymore, except to remember to try and stay out of the sun. I hope to see you tonight. Live from New York. 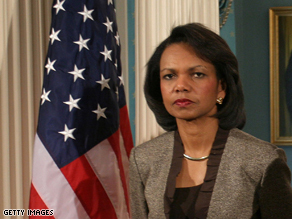 Sen. Barack Obama has called for a national discussion on race in America, and one of the folks who sure didn't hold back when asked was Secretary of State Condoleezza Rice. In a discussion with the editorial board of the Washington Times on Thursday, Rice called racism a "birth defect" of America, and said that black Americans have loved the nation even when it didn't love us. “As a result, Miss Rice told editors and reporters at The Washington Times, "descendants of slaves did not get much of a head start, and I think you continue to see some of the effects of that..."
What’s on tap for 360° tonight? Check out 360°'s web-only preview, and find what the 360° staff has in store for tonight. Treasury Secretary Henry Paulson proposed a set of sweeping changes on Monday aimed at modernizing the nation's financial system in what could herald the biggest regulatory overhaul of Wall Street since the Great Depression. Iran was integral in persuading Shiite cleric Muqtada al-Sadr to halt attacks by his militia on Iraqi security forces, an Iraqi lawmaker said Monday. Sen. John McCain on Monday recalled his family history and patriotic roots as he kicked off a tour to introduce himself to the general electorate. A man who had argued with his estranged wife over the custody of their three children has confessed to drowning them in a hotel bathtub on the night they were to go back with their mother, police said Monday. A missing pregnant woman has been found dead in Texas nearly 60 miles from where she was last seen alive. Nothing could have prepared me for what they revealed. Most of these women were cut all the way around, from their back to their belly button. Their upper belly hung awkwardly over their lower belly, as if you put a belt around their midsection and tightened it as much as you could. On all of them, a deep black scar circled the abdominal area. One woman showed me her incisions – still open and bleeding slightly, years after her surgery. That same woman no longer has a belly button. She said she was told she would heal better from the “inside out,” so he took a scapula and cut her back open after she had complications with incisions. Another woman showed me her lopsided breasts. One much larger than the other. One woman who couldn’t be there because she’s too sick emailed us a picture of her with a volley-ball sized ‘pouch” attached to her abdomen. She told us it holds her intestines. Happy Monday... How was your weekend? Relaxing? Productive? None-of-the-above? Don't sweat it, we'll help you get through the work-day with a dose of ‘Beat 360°.’ Everyday we post a picture – and you provide the caption. Our staff will get in on the action too. 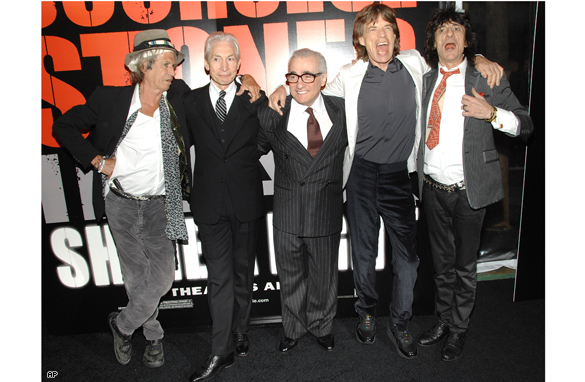 Here is today’s “Beat 360°” pic of the day: We have Director Martin Scorsese posing with the Rolling Stones (left to right: Keith Richards, Charlie Watts, Mick Jagger and Ronnie Wood) at the premiere of "Shine A Light" featuring The Rolling Stones. Update: Check out last night's winner! Did the flood of earmark requests crash Congressional computer? Hi all... I just want to let you know we're still tracking the flood of Congressional requests to earmark and spend millions of your tax dollars for pet projects. The silly spending season in Congress opened with a bang, or maybe the more appropriate word is a crash. So many requests for next year’s spending bills flooded the Appropriations Committee that the computer couldn't handle it. Committee staff says the computer "got very slow" when everyone sent in their requests at once. They insist it wasn't a "crash," just a big slow down. Um, are we parsing a little bit here? 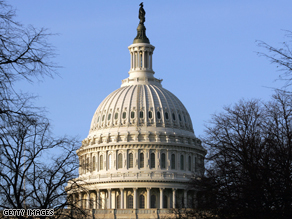 In any case, the "slow down" prompted House leaders to move the deadline later to let members get in all their zillions of earmark requests for next year. How many are there and what are they? If you've been following this issue, you know Congress doesn’t trust you and me with that information yet. We've got our sources working it, though...so stand by. Housing Secretary Alphonso R. Jackson is expected to resign Monday, The Wall Street Journal reported Sunday night. A sweeping overhaul of financial regulation that Treasury Secretary Henry M. Paulson Jr. will propose today started out last year as an effort to streamline and deregulate oversight of global markets, but the administration was forced to add elements addressing the mortgage crisis as it escalated this year. After nearly four years of hoping, waiting and praying, an Ohio family learned Sunday their missing son died in Iraq. Shiite cleric Muqtada al-Sadr called on followers to stop shooting and cooperate with Iraqi security forces Sunday, a move Iraq's government praised as a step toward ending six days of fighting that has left hundreds dead. Barack Obama has extended his lead over Hillary Clinton among Democrats nationally to 52% to 42%, the third consecutive Gallup Poll Daily tracking report in which he has held a statistically significant lead, and Obama's largest lead of the year so far. Barack Obama refused Saturday to go along with other Democrats who are calling for Hillary Rodham Clinton to step away from the race for the Democratic presidential nomination. Bill Clinton tells superdelegates to "chill"
Former President Clinton urged Democratic Party superdelegates and activists Sunday to be patient in selecting a presidential nominee and let the primary election process play out over the coming months. A year into his tenure on Capital Hill, Sen Barack Obama (D-Ill.) approached John McCain on the Senate floor to propose the two work together on a lobbying and ethics reform bill. The four-term Arizona Republican, 25 years Obama's senior, quickly saw a willing apprentice to help shake up the way business was done on Capitol Hill. With attention focused on the Democrats’ infighting for the presidential nomination, Senator John McCain is pressing ahead to the general election but has yet to sign up one critical constituency: the big-money people who powered the Bush fund-raising machine. The coroner heading the inquest into the death of Princess Diana says there is no evidence that Prince Philip, the Secret Intelligence Service or any other government agency was involved in her death in 1997. Stephen Curry darted this way, faked that way. Nothing open, and the bright red numbers on the clock getting close to zero.